Finally, the temperatures are warming, the birds are singing, the butterflies are fluttering, and the sweet smell of spring is in the air. You want to rejoice and welcome the season, but you can’t. It’s May. Now is not the time to stop and smell any roses. Now is the time to gear up your patience and make sure your car has plenty of gasoline because Mom’s Taxi Service is in full swing. If you have kids in school, you know exactly what I’m talking about. The kids are losing focus on school work and getting grumpier, but their calendar is jam-packed with baseball and soccer tournaments, last-minute field trips (you can chaperone, right? ), end-of-year concerts and plays, award ceremonies and banquets, classroom parties, and Teacher Appreciation Week (why do kids use so many tissues?). That’s not to mention birthday parties and sleepovers, Mother’s Day, weddings and religious ceremonies, school tours and open houses for next Fall, researching and signing up for summer camps, getting your summer garden planted, and finding the perfect potluck dish for your neighbor’s Memorial Day party. Oh, and don’t forget about keeping the house clean, doing all the shopping, car maintenance, cooking, laundry, and doctor’s appointments, not to mention working your regular job if you have one. It’s all crazy insane! And if you’re a single mom, it’s extra crazy insane! So, what’s a poor mom to do? 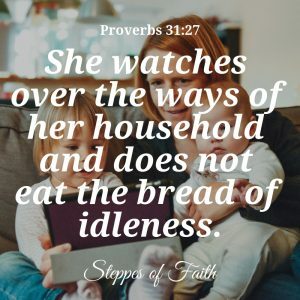 While many moms might choose a fancy organizational tool or phone app (or maybe even sip a glass of wine or two) to keep ourselves on track, God reminds us He is the ultimate answer to our chaos. 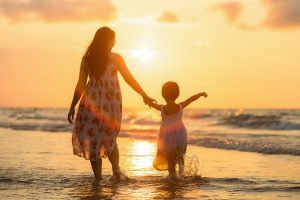 I once heard if moms were paid money for every job they did to keep the family engine running smoothly, they would earn well over a six-figure salary. Deservedly so! We moms work our tails off, which leads some moms to complain they never get thanked, but let’s be honest. We do it all for only one reason ̶ love. Am I right? The month of May is crazy, weird, and tinkers on the edge of insanity, but our love for our family transcends everything. It never enters our minds that we aren’t getting paid. That hug we get at the end of the day is payment enough. But, let’s not overlook the fact it’s hard to keep our cool sometimes. Some days are almost more than we can take. That’s when we need to turn to our loving God and reset ourselves in Him. But, how do we do that when the world is rushing by at 1,000 miles per hour? God commands we keep a Sabbath day (Exodus 20:8). That’s difficult to do even if we’re begging for one. Now, don’t get me wrong. I completely encourage you to set aside a full day to rest with the Lord, but for the day-to-day moments, remember that God is more than enough to give you peace, strength, and sustainability so you can tackle even the toughest of time management tangles. One way we can focus better on God is to remember a few of His names. Maybe you knew that He has many names, each one describing one aspect of His multi-faceted character. But, with approximately 956 names in various translations, it’s good to memorize a quick few of them so you can pray more effectively. 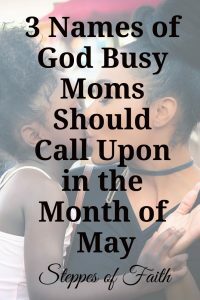 And, goodness knows moms pray a lot during May! To get you started, here are three of God’s names- both in English and Hebrew for full effect- that I think are extremely helpful, plus some key Scriptures to encourage you and keep you sane this month. May doesn’t have to be an exercise in keeping our sanity and seeing how many plates we can spin at one time. Trust in God, call out His name, and find your rest in Him knowing He’s going to see you through the madness…all in time for summer break. What are you doing to stay organized and keep up your energy during the month of May? 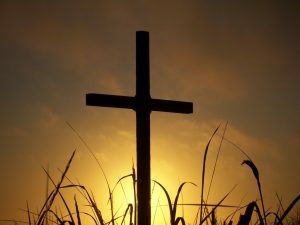 Is there a Bible verse you have memorized that’s especially helpful? How can we encourage other moms who don’t rely on God when the going gets tough? Please leave your thoughts, comments, and prayer requests below, or you can contact me here. I’d love to hear how you’re surviving May. If you would like to further explore more of God’s names and what each of them means, check out Pastor Tony Evans’ book, The Power of God’s Names, right here. This is NOT an affiliate link, just an awesome book to build your personal relationship with the Lord.